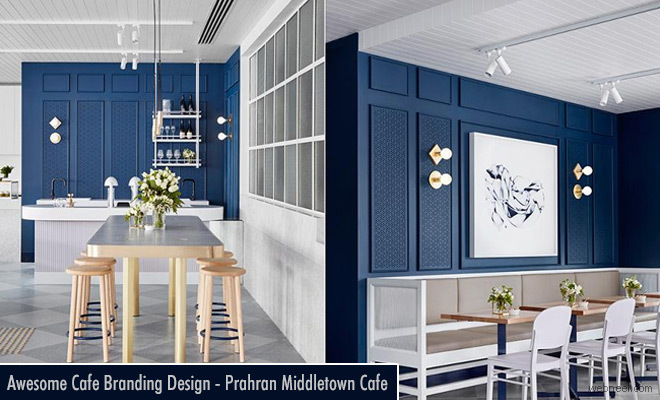 Cafe Branding Design : Prahran MiddleTown Cafe has opened recently in Melbourne and it's themed as "Prahran's brunchery royale". Infact the theme has been inspired from the Royal, Kate Middletown. You can find the cafe's interiors all in blue and white, which looks so elegant. You can see bright white tiles and panneling, navy blue walls and lots of intricate detailing. Well it sure has made the locals happy and people are thronging this cafe for a royale treatment. So if you happen to be in Melbourne and want to catch up a leisure brunch, step into middletown cafe. The brand identity design has really worked for these guys, since you have a variety to choose from and you can also find a corner table with ample light, so you can work while you munch away at the royale brunchery. Brand designs are quite popular these days to revamp the old business or even introduce a new one.